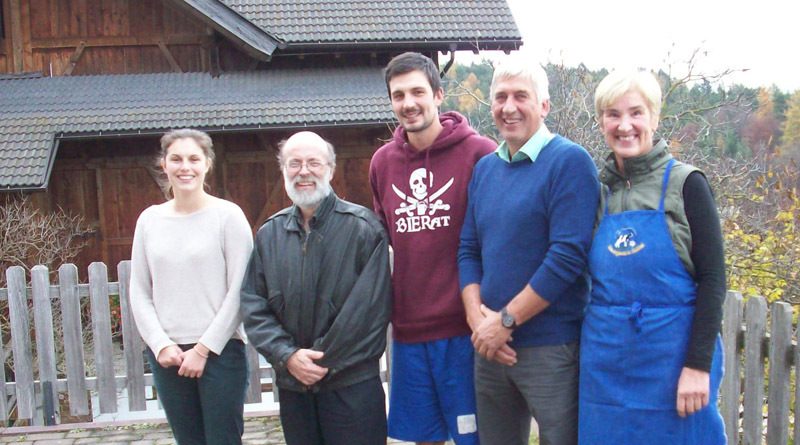 Allumette Island farmer David Gillespie recently travelled to northern Italy where he attended an agritourism conference and toured local farms. Pictured, Gillespie (second from left) poses with the Fink family on their farm on the steep mountainside near Bolzano, Italy. 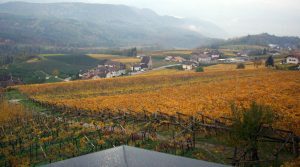 Sinn family’s bio-certified vineyard near Bolzano, Italy. The Dolomites are visible in the background. Pontiac farmer and agriculture advocate David Gillespie recently returned to the Pontiac after nearly two weeks in Italy, where he toured local farms and gave a presentation at an international agritourism conference. Nestled in the mountains in the top end of the boot, Bolzano is the home of Eurac, a private research facility that studies a wide range of topics. The facility hosted the First World Congress on Agritourism from Nov. 7-9, bringing together researchers and stakeholders from 42 countries to discuss the issue.